Brother/Sisters : 3 Sister and 3 Brother Bhai Mahinder Singh , Bhai Swarn Singh and Bhai Kulwarn Singh. Children : Bhai Jaswinder Singh. Jathedar Sahib was a great Sikh. His Nitnem consisted of 18 banis. He got up at 2am to do simran for 2 hours. He could do a Sahej Paath by himself in four days. He would do a 12-13 hour Rohl. Jathedar Sahib gursikhi jeevan is something to aspire to. The world would be a better place if there were more men and women like him. The Sikh nation had not yet got over the shaheedi of these two generals when on 15th October 1992 a news came out that another Sikh general was killed, Jathedar Bhai Talwinder Singh Babbar. Shaheed Bhai Talwinder Singh Babbar name comes amongst those Gursikhs who after 13th April 1978 knew that Sikhs were treated as second class citizens of India and to protect the freedom of Sikhs weapons must be raised. With a beautiful Dumalla and in a Bana of Khalsa, whoever saw Bhai Talwinder Singh Babbar felt as though they have done darshan of a puratan singh. Looking at the contributions of Bhai Sahib in the struggle for Khalistan, we can see why Bhai Sahib is one of the great generals of the Sikh Freedom Movement. Bhai Sahib was born on 26th February 1944 in the house of Sardar Jamiat Singh and from the womb of Mata Surjit Kaur in the village of Panshta, district Kapurthala. Sardar Jamiat Singh had been married twice, the first marriage was with Bibi Dhan Kaur and had 3 daughters and one son, Bhai Mahinder Singh. The second marriage was with Mata Surjit Kaur in which they had 3 sons, Bhai Talwinder Singh Babbar, Bhai Swarn Singh and Bhai Kulwarn Singh. Bhai Sahib studied up till 10th class at the local school of the village and after helped his father in farming. Bhai Sahib had a great sense of humour and was seen joking with his brothers and sisters regularly. As well as studying Bhai Sahib had great interest in business. The whole village would praise Bhai Sahib to his father, Sardar Jamiat Singh. The house was always full of people and had a happy atmosphere. Bhai Sahib friends could never have guessed that Bhai Talwinder Singh Babbar would such a big sacrifice for the Sikh faith. In 1964, Bhai Talwinder Singh Babbar was about twenty years old when he married Bibi Surinder Kaur, daughter of Sardar Chanan Singh from the Jalandhar districts, village Padhianay near Aadampur. Bhai Sahib was very close to his father in law, Sardar Chanan Singh. Soon Bhai Talwinder Singh Babbar started staying at his own house, separate from his family. Later Bibi Surinder Kaur gave birth to a son, Bhai Jaswinder Singh. To financially support his family, Bhai Sahib worked at his farms as well as having side businesses, but this was not enough. In the Doaba area, Sikhs have always gone abroad to earn money. In 1970, to earn a good living Bhai Sahib along with his family went to Canada and settled in British Columbia, Vancouver. Here Bhai Sahib saw the birth of another son, Bhai Narinder Singh and a daughter Bibi Rajinder Kaur. After the birth of his daughter, Bhai Sahib started to get into Sikhi. In 1975, Bhai Sahib went to Pakistan with the sangat of Canada to do darshan of Gurudwara Panja Sahib and other historical gurudwaras. In Pakistan Bhai Sahib took amrit from the Panj Pyare at Gurudwara Panja Sahib and the following year in 1976, the whole family joined Bhai Sahib and became Gursikhs by taking amrit. After becoming a Gursikh, Bhai Sahib gathered the singhs in Canada and started preaching Sikhi and its code of conduct. Bhai Sahib’s first act was to stop the sale of Sri Guru Granth Sahib Ji as an ordinary book in Canada. Later, Bhai Sahib undertook the mission of elimination of un-Sikh like practices from the Gurdwaras in Canada. Bhai Talwinder Singh Babbar, along with his friends, had to struggle hard to stop the entry of bare-headed people into the worship halls of the Gurdwaras. On 13th April 1978, the Narakhdharis killed 13 singhs and wounded more than 150 Sikhs in Amritsar, who had been peacefully protesting against the beadbi of Guru Granth Sahib Ji by the Narakhdhari cult. As soon as Bhai Sahib heard of this news his insides were filled with pain. Bhai Sahib straight away got a ticket to India. When in Punjab, Bhai Sahib saw the RSS, Shiv Sena and Narakhdhari offices everywhere. Bhai Sahib the Akali ministers giving power to the Narakhdharis, the killers of Sikhs. Bhai Sahib gathered likeminded Sikhs and started a group, Chalda Vaheer Chakarvarti Dal. This group started preaching Sikhi all over Punjab and making Sikhs aware of the attacks of the Sikh religion in Punjab. Baba Nihal Singh of Harian Velan also helped Bhai Sahib make this mission of awareness possible. In the Bana of Khalsa, Bhai Talwinder Singh Babbar made Sikhs of Punjab the dangers the faith faces and to connect to Gurbani and Bana. On 4th January 1980, the courts of Karnal acquitted the Narakhdhari leader, Gurbachana of the murders of Sikhs, along with the 64 accused of supporting the Visakhi massacre on 13th April 1978. 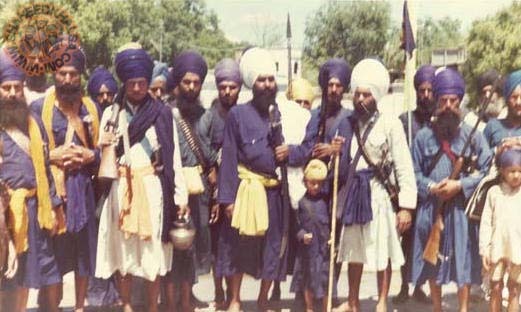 The Narakhdharis had openly killed the Sikhs, but the Indian justice system had failed to deliver justice to the Sikhs. Narakhdhari Gurbachana mocked the Sikhs by saying, “Your 6th Guru, Guru Hargobind Sahib is known to have 52 kings released with him, but I have freed 64.” In these conditions the Sikh nation felt useless, as the law of India had not only failed to deliver justice to the Sikhs of India but also the justice of humanity. Sant Jarnail Singh Ji Bhindranwale had lost his patience with the justice system of India, now the singhs of Dam Dami Taksal were anxious to punish the Narakhdharis for the killings of innocent Sikhs. On one side Bhai Sukhdev Singh Babbar, Bhai Surinder Singh Nagoke, Bhai Sulakhan Singh Babbar and Bhai Anokh Singh Babbar were also planning to punish the Narakhdharis. On the other side gunmen of SSP Simranjit Singh Mann of Faridkot, Bhai Amarjit Singh Khemkaran and Hawaldar Bhai Gurnam Singh were also ready to punish the Narakhdharis. Bhai Talwinder Singh Babbar met Bhai Wadhawa Singh, Bhai Tarsem Singh Kala Singhia and the gunmen of SSP Simranjit Singh Mann. These singhs made the decision that now is not the time for preaching, as preaching will not get us justice. On 24th January 1980, Bhai Ranjit Singh and Bhai Kabal Singh punished the Narakhdhari leader, Gurbachana but other Narakhdharis who had the same thinking and backing as Gurbachana were also on the hit list of the Sikhs. According to the page 46 of the Khalistan Struggle book by senior journalist Jagtar Singh, the singhs of Akhand Kirtani Jatha were planning to punish many of these anti-Sikh Narakhdharis leaders in Punjab. This book also stated that Bhai Sahib went back to Canada to arrange money and arms to put into the armed struggle, after arranging all this Bhai Sahib came back to Punjab. Jagtar Singh writes in his book that Bhai Talwinder Singh Babbar gifted Sant Jarnail Singh Ji Bhindranwale a Mauser. When the shipment of weapons which were arranged by Bhai Sahib came to Punjab, the Narakhdhari leaders were getting killed one by one. On 5th August 1981, Jathedar Bhai Sukhdev Singh Babbar punished the first Narakhdhari in Anandpur by the name of Shaadi Lal and from here onwards the Narakhdharis were joining Shaadi Lal in hell. The singhs of Dam Dami Taksal on 9th September 1981, killed Jagat Narayan, a journalist of Jagbani newspaper who had wrote venomous articles against Sant Jarnail Singh Ji Bhindranwale and the Sikhs of Punjab. On 20th September 1981, Sant Jarnail Singh Ji Bhindranwale gave his arrest to the police in the Jagat Narayan murder case at Chownk Mehta. That same night the singhs killed 3 enemies of the Sikhs in Jalandhar and similar actions happened in other cities around Punjab. Everyone knows of panthic Shaheed, Bhai Dilawar Singh Jaisinghwala, who became a human bomb and blew Butcher Beanta into pieces at Chandigarh Secretariat on 31st October 1995. At the same secretariat, the singhs of Babbar Khalsa also attacked a Narakhdhari here on 16th October 1981. This attack happened a day after Sant Jarnail Singh Ji Bhindranwale’s release. The Narakhdhari leader, DC Niranjan Singh of Gurdaspur had been named as one of the main person responsible for the killings of the 13 singhs on 13th April 1978. The Sikh nation hated to see this evil man breath on earth. The Indian government wanted to keep Niranjan Singh safe and for this reason they placed him at the Chandigarh Secretariat. 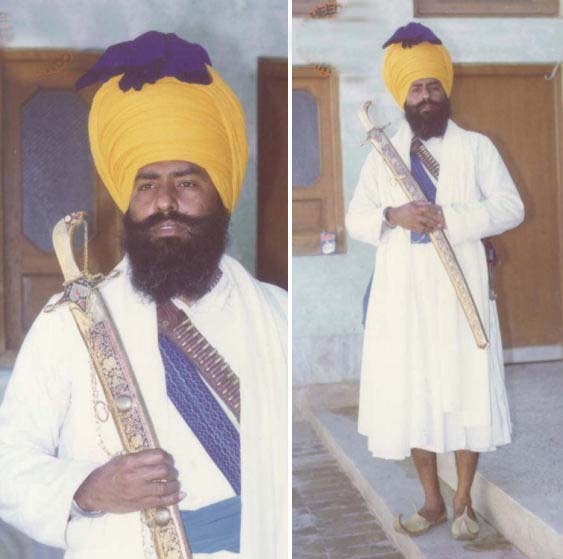 Jathedar Bhai Sukhdev Singh Babbar, Bhai Amarjit Singh Khemkaran and Bhai Wadhawa Singh went to the Chandigarh Secretariat to kill this killer of Sikhs. When the singhs of Babbar Khalsa saw Niranjan Singh they fired bullets at him, but the coward, who once had opened fire on to a crowd of unarmed Sikhs, ran for his life inside the secretariat but in the cross fire Niranjan Singh’s brother, Surinder Singh was killed. 23rd October 1981, in Bhai Sahib’s village a Narakhdhari, Mahinderpal was killed by three singhs on a motor bike. Bhai Sahib, Jathedar Bhai Sukhdev Singh Babbar were carrying out such missions but very secretly. The police did not know who was carrying out these killing of the Narakhdhari, but soon this would come out in the open. On 6th November 1981 a singh, Bhai Surjit Singh was arrested and after brutal torture of the police, he revealed all the information of Babbar Khalsa to the police. Now the police knew the killers of the Narakhdharis and the racist police officers were the singhs of Babbar Khalsa. The police also came to know that some of the police officers were part of Babbar Khalsa and this shocked them to the core. The actions of Bhai Sahib Talwinder Singh Babbar and Babbar Khalsa were out in the open. After the police got information from Bhai Surjit Singh, the police quickly started raiding the possible locations of the singhs. The singhs of Babbar Khalsa told Bhai Sahib to leave Punjab instantly, but Bhai Sahib did not want to leave the battlefield. As the singhs pushed Bhai Sahib to leave Punjab, on 15th November 1981, Bhai Sahib escaped India from the borders of Nepal and via Denmark Bhai Sahib reached Canada. After Bhai Sahib had left India, many singhs of the Sikh Freedom Movement were getting arrested and killed. Bhai Sahib Talwinder Singh Babbar knew to leave India was the right decision. Prime Minister, Darbara Singh gave freedom to the police to kill Sikhs. A list 11 singhs from the Babbar Khalsa was prepared by the Indian security forces and the big sum of money was put on their head as a reward. A sum of 1 lakh rupees was put on the head of Bhai Sahib. Ads were put into newspapers about the rewards for the capture of these Babbars. Bhai Sahib’s house in Panshta was bought to the ground by the police with all the furniture deliberately burnt. The police crossed the line of harassment and started torturing the family members of Bhai Sahib. Bhai Sahib’s Talwinder Singh Babbar 80 year old father, Sardar Jamiat Singh’s beard was pulled by the police and was inhumanely tortured. The police also raided the houses of Bhai Sahib’s relatives, including his in-law and arrested his father in-law. The police charged Sardar Chanan Singh wit accommodating Khadku Singhs and locked Sardar Chanan Singh in Bhujath jail. Similar torture was served to the relatives of Bhai Wadhawa Singh and Bhai Tarsem Singh Kala Singhia. The families were released after 55 days of torture on 9th January 1982. Justice Tarkunde ordered an investigation into the treatment of the families by the police. Then Jathedar of Sri Akaal Takht Sahib, Gurdial Singh Ajnoha wrote to Prime Minister, Darbara Singh regarding the ill treatment of the Sikh families. In this letter Jathedar Darbara Singh Ajnoha compared Darbara Singh to Mir Mannu. In Canada, Bhai Sahib did not keep quiet. Bhai Sahib continued supporting the Sikh Freedom Movement from Canada. Bhai Sahib told the Babbar Khalsa singhs in Canada to make long term plans for Khalistan. Bhai Tarsem Singh Kala Singhia also escaped out of India from the Nepal border to Denmark and then to Holland. Bhai Wadhawa Singh was with Bhai Tarsem Singh Kala Singhia but in September 1983 came back to Pakistan. After coming to Canada Bhai Sahib Talwinder Singh Babbar lost contact with the Babbar Khalsa in Punjab. Bhai Sahib would go out of Canada to other countries and do lectures of the Sikh Freedom Movement. In June 1983, after a request from the Sikhs of Europe, Bhai Sahib planned a trip to England and countries around Europe. When Bhai Sahib reached West Germany on 25th June 1985, Bhai Sahib was arrested by the German police. Bhai Sahib was arrested due to India releasing an Interpol warrant against Bhai Sahib. The Germany started a case to give the custody of Bhai Sahib Talwinder Singh Babbar to the Indian government. Sant Jarnail Singh Ji Bhindranwale also spoke of this case at one of the speeches of Dharam Yudh Morcha. After 13 months in jail, on 7th July 1984 the government denied the Indian government the custody of Bhai Sahib and released him. The attack of Sri Harimandir Sahib in June 1984, left every Sikh in dismay and now the Indian government wanted to permanently finish the Sikhs off. The Sikhs from all four corners of the world, were coming to Indian and step into the battlefield against the oppressing Indian government. After being released Bhai Sahib Talwinder Singh Babbar went back to Canada and again started doing lectures of the Sikh Freedom Movement in Punjab. On 23rd June 1985 an Air India plane blew into pieces in mid-air over the Atlantic Ocean. The explosion happened due to bomb in the baggage area of the plane and killed all 329 passengers aboard. Similar attack happened in Tokyo’s Narita Airport but luckily the bomb did not make it in to the plane and exploded in the baggage collection area of the airport. These terrorist attacks were blamed on Babbar Khalsa of Canada. It was said in revenge for the attack on Sri Harimandir Sahib by the Indian government the Sikhs did this act of terrorism. These accusations were believed to be inaccurate from day one. In fact some were saying that this was the cowardly act of the Indian secret agencies to make the Sikh Freedom Movement look bad in international media. Due to such false accusations the international aid did not get involved into the Sikh Freedom Movement, as it seemed that Indian government was victimised here. The Canadian government arrested Bhai Sahib and Bhai Ajaib Singh Bagri in November 1985, but in the long investigation by the Canadian both singhs were found not guilty and released in January 1986. Soon after Bhai Sahib was arrested again for supposedly, planning to blow up the Indian house of parliament. 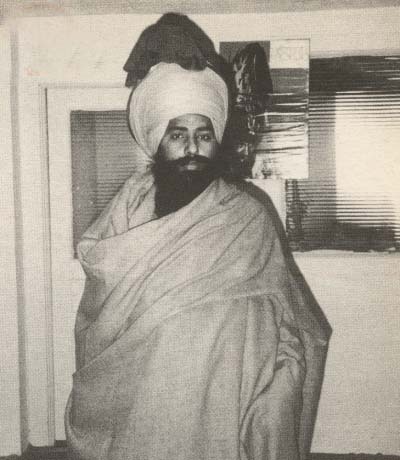 In May 1987, Bhai Sahib was once again acquitted by the Canadian law. Bhai Sahib remained in jail till 14th April 1987. Bhai Sahib Talwinder Singh Babbar had to undergo hunger strike again for right to vegetarian meals. Bhai Sahib knew that the Indian government would create problems for him in Canada. In June 1988 Bhai Sahib Talwinder Singh Babbar went to Pakistan where one his relatives, Bhai Manjit Singh who was in jail for hijacking a plane in Pakistan. Bhai Manjit Singh, Bhai Parminder Singh Harafanmala, Bhai Gurdeep Singh Pardesi, Bhai Gurwinder Singh and few more singhs had hijacked a plane in 6th June 1984. About 20 minutes into the flight, several Sikhs rushed up the aisle. In the blur, I spotted their 10-centimetre (4-inch) Kirpan, a traditional warrior’s dagger. One man fired a pistol to draw attention. Some Sikhs ran down the aisles screaming slogans and slapping some passengers to terrify them. It worked. They shouted slogans supporting Sikh autonomy in India’s Punjab state and for Jarnail Singh Bhindranwale, the Sikh leader who died in the Indian army assault on the Golden Temple in Amritsar in early June. Some Sikhs stormed the cockpit, ordering Flight Engineer P.N. Mahajan, 54, to be fly the plane to Pakistan. Condemning the army for the Golden Temple raid, they tore the stripes off the uniform of an Indian army colonel at my right. After at first being refused permission to land in Lahore, we touched down at about 6:45pm Indian time. Pilots told the control tower he was running out of fuel and the hijackers were threatening to set off a bomb. The next day, at about 10:30am, at least three people fainted or found it hard to breath. Two doctors were summoned to give them oxygen. An hour later, one of the Sikh men spoke over the intercom in Punjabi and said, “The Pakistan government is not cooperating. We will blow up the plane or set it on fire in five minutes.” Silence fell over the cabin. I prayed for the first time in a long while. At 12:20pm the same Sikh spoke again, and his words brought applause. Their leader of the Sikh group had left the plane to talk with a Pakistani official, I was told. Five minutes later he returned and announced we were to be freed. On 20th January 1986 the Pakistani courts gave its verdict and released Bhai Manjit Singh and Bhai Malagar Singh. Bhai Sahib Talwinder Singh Babbar recruited both singhs into Babbar Khalsa and introduced the battlefield to them. On 25th October 1990, Bhai Manjit Singh and Bhai Malagar Singh were crossing the Indo-Pak border from Rajasthan, when all of a sudden the BSF spotted them and an encounter started, both singhs attained shaheedi. After the shaheedi of Bhai Manjit Singh Babbar and Bhai Malagar Singh Babbar, Bhai Sahib did not lose courage and carried on doing panthic actions. As well as continuing with the armed struggle, Bhai Sahib also tried to strengthen the Sikhs politically. In 1990, Bhai Sahib came back to India via Pakistan, he re-joined Babbar Khalsa. Bhai Sahib was made Jathedar of an area by Jathedar Bhai Sukhdev Singh Babbar. Bhai Ajaib Singh Bagri also joined Babbar Khalsa along with Bhai Sahib. Bhai Sahib was doing many actions under Babbar Khalsa and everything was running smoothly. Bhai Sahib Talwinder Singh Babbar even attended Panthic Committee meeting behalf of Babbar Khalsa. Bhai Sahib then went to Bangkok via Nepal border. While in Bangkok, Bhai Sahib made the decision of leaving Babbar Khalsa and then went Europe. 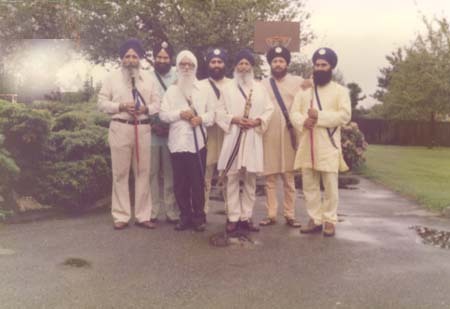 In Europe Bhai Sahib met ex-Babbar Khalsa members such as, Bhai Harwinder Singh Bhatori, Bhai Raghbir Singh Tanksahlo, Bhai Surinder Singh Sekhon and created Babbar Khalsa Parmar Group. After creating his own group, Bhai Sahib came to Pakistan again. Then from Pakistan, Bhai Sahib entered Punjab. As Bhai Sahib was setting up his network, he travelled all over India and once in Jammu Bhai Sahib Talwinder Singh Babbar was arrested. In 1992, the Sikh Freedom Movement was shook many times, when it lost some of the great Sikh generals of the armed struggle. On 29th July 1992, Jathedar Bhai Gurjant Singh Budhsingwala attained shaheedi and then on 9th August 1992 Jathedar Bhai Sukhdev Singh Babbar attained shaheedi. The Sikh nation had not yet got over the shaheedi of these two generals when on 15th October 1992 a news came out that another Sikh general was killed, Jathedar Bhai Talwinder Singh Babbar. In September 1992, under the command of DSP Harmail Kaur Chandi, the police arrested Bhai Sahib after information of Bhai Sahib being in Jammu was given to the police by an informant. After Bhai Sahib was arrested the police transferred him to many police stations of Phillaur and in the process Bhai Sahib being inhumanely tortured. Then SSP Satish Kumar Sharma tied the wounded Bhai Sahib up and rained fire of bullets from his AK47 on to Bhai Sahib. In the press conference, the police told the media that Bhai Sahib Talwinder Singh Babbar had been killed in a fierce encounter along with six other Khadku Singhs. The encounter was shown to happen in the village of Kang Arian, near Phillaur. In this encounter, two Muslim men were also shown to be killed. In fact these two Muslim men had been arrested in Delhi in May or June 1992. In reality, Bhai Sahib had no links to these Muslim men. One of the Muslim men was from Kashmir and the other was a manager of a hospital in Lahore, Pakistan. The police tried to link Bhai Sahib to Pakistani extremists but the Sikh nation knew Bhai Sahib Talwinder Singh Babbar was not linked to Pakistani agencies, such as ISI. 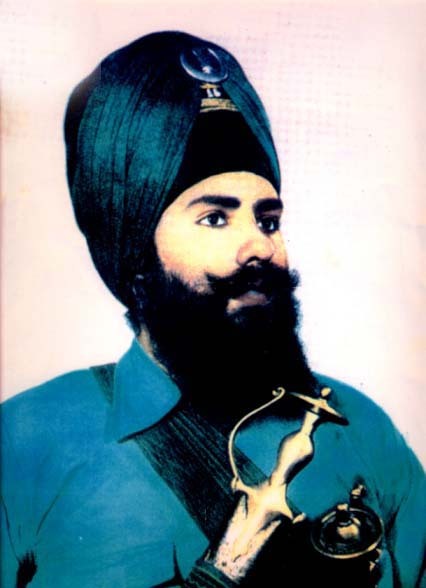 After the shaheedi of Bhai Talwinder Singh Babbar, Bhai Surinder Singh Sekhon was given the command of the Parmar Group. Some years later in July 1996, Bhai Surinder Singh Sekhon joined Dal Khalsa. Bhai Sahib was in love with cause of the Sikh Freedom Movement, he had devoted most of his life to this cause and the cause was the freedom of the Sikhs. Bhai Sahib’s appearance of a Khalsa in beautiful Bana and sharp eyes were like seeing a puratan singhs. Bhai Sahib could have carried on living the comfortable life in Canada, but Bhai Sahib could not see the Sikhs treated as second class in India and Bhai Sahib could not allow the fire of Sikhi burn out within him. In the Indian agencies played many tricks to discredit Bhai Sahib Talwinder Singh Babbar, but even today it is visible that Sikhs around the world still respects and honours Shaheed Jathedar Bhai Talwinder Singh Babbar, a fallen Sikh general. ਇਹ ਗੱਲ ਸ਼ਾਇਦ ਹੀ ਕਦੇ ਨਸ਼ਰ ਹੋ ਸਕੇ ਕਿ ਕਨਿਸ਼ਕ ਜਹਾਜ ਕਾਂਡ ਦੀ ਅਸਲੀਅਤ ਕੀ ਹੈ?